A wonderful tribute, we saw the one at the tower of London, you got a good shot of it, Bill. Bill Phillips: There has been a tour of these poppies. Hereford I think is the penultimate one with the last one being Carlisle. This is an incredible tribute - so beautiful and poignant. Clever stuff isn't it, speaks a thousand words.. There was something similar on St Magnis Cathedral, Orkney last may and there's another now at Fort Nelson near Gosport. They make for impressive and a thought-provoking display. 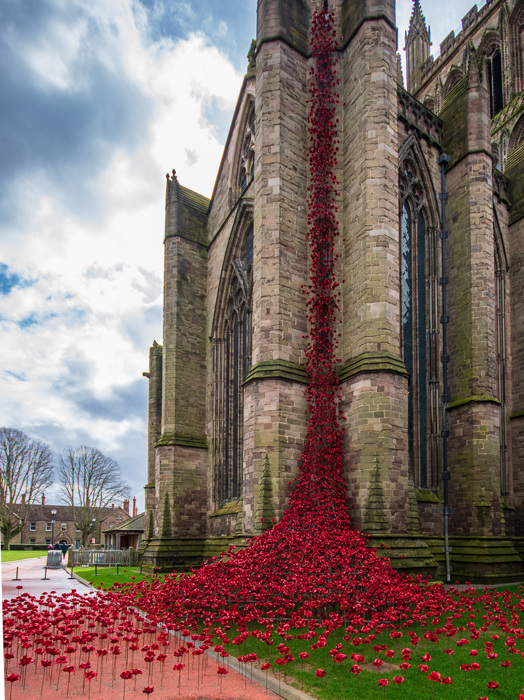 Bill Phillips: The poppies have been touring the country. Hereford is I think the penultimate one with the final one being at Carlisle cathedral. A very touching memorial - I remember these poppies at the Tower in London. Verneffective a d too pretty in my book, considering the meaning. I would rather a tip up truck dump them on the doorstep of Buckingham Palace with a note telling them that this was what happens when Royal cousins fall out. Is this still showing? I thought it was marvelous when first displayed. Bill Phillips: It is a fine display. A fine shot Bill, they really look good. These Poppies were made for the Tower of London presentation quite near to us and the designer and people who made them featured on our local TV quite a lot at the time. beautiful gift from the people of the parish and town. Thank you for the REST OF THE STORY Bill.